IGNIO Circus Company is blending local and international talent to bring professional circus to Victoria. 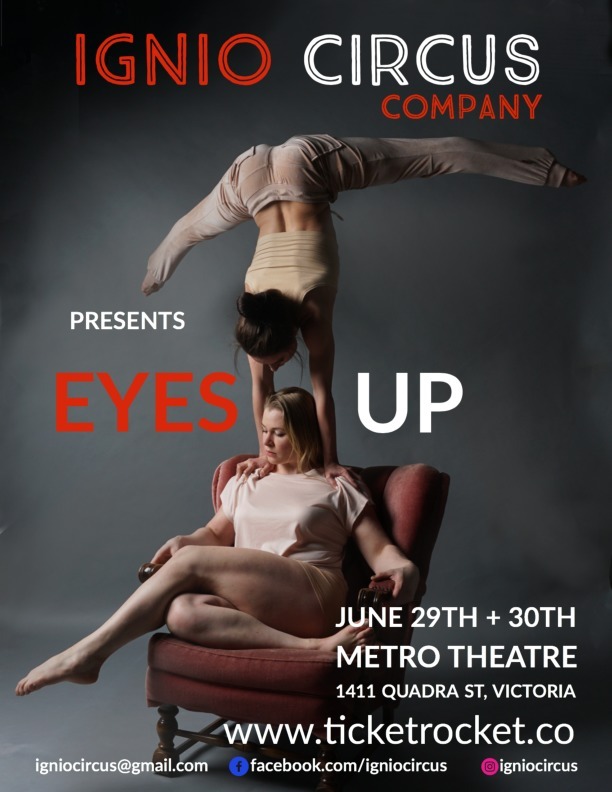 EYES UP delves into topics that permeate our everyday lives. We rely on technology everyday as a vehicle for communication but what do we do once it drops us off at our destination? EYES UP is about our natural desire to connect; what happens when we look up to find a genuine human encounter right in front of us? The cast’s breathtaking physical abilities will have you sitting on the edge of your seat! Through an incredible mix of acrobatics, juggling, and comedy we explore and express the beauty and awkwardness of interacting face to face. Come to witness an ordinary space transformed into an extraordinary, hilarious, and poetic experience of what it is to be human. ABOUT THE ARTIST: For the past 10 years director and performer Kaelyn Schmitt has been traveling internationally and performing as a professional trapeze artist. For the past 3 years she acts as an artistic director in Europe during her winter contracts. She is excited to create and promote circus here on Vancouver Island, where it is scarcely seen. Her goal is to make high level contemporary circus accessible to everyone, and to share her passion for the circus arts with her hometown.